Happy almost-end of Summer! Here are some great photos from the July South Florida Mod meeting. And an incredible quilt made by all of the talented members of the Guild! Thank you so much! --Bring in projects relating to zippers and how to use them. Bags, art quilts, wearables, etc. --If you took zippers for our "zipper challenge," please bring in the results (or works in progress) for Show and Tell! For our August Block of the Month, we are using one of the Sew, Mama, Sew block of the month patterns! It's quick and allows you to try your hand at a bit of VERY easy paper piecing! Our next meeting will be held on Saturday, August 16th, from 10am to 12pm at StitchCraft in Boca Raton. See you soon! Block of The Month - April, May and June 2014! Here are the Blocks of the Month for April and May/June! April 2014: Charm Square Butterflies. In honor of springtime, our April Block of the Month is the Charm Square Butterfly block! These are small, wonky and quick to create, so make a bunch! May/June 2014: Big Polaroid Block. Our May/June Block of the Month is a big polaroid block! Please use white around the edges to make the focus fabric look like an old-school polaroid. This is perfect for using novelty fabrics! Note: we will be having a charity sewing day in lieu of the May meeting (more information to follow), so this block is for both the May and June meetings. We will have the drawing in June; if you bring in your block for May but do not plan to attend the June meeting, please pin your name to the block so we know who to contact if you win. Here are some great new shows and updates from our mailbag! 1. Treasure Coast Quilt Guild: Quilt Beach! --The Treasure Coast Modern Quilt Guild is hosting a big Modern Quilting show, called Quilt Beach! --Located at the First Presbyterian Church, 520 Royal Palm Boulevard, Vero Beach, FL. --Luke Haynes and Victoria Findlay Wolfe will be speaking (by digital uplink) to the participants. --There are optional workshops as well. --Modern quilts from all over the state are being exhibited, there are vendor tables and other MQGs from the state will be present. --You can submit your quilt for exhibition! 2. Coral Springs Quilt Guild: Cheryl Lynch guest speaker and workshop! --Friday, February 28th, 2014 at 7:00pm at Cypress Hall at Cypress Hammond Park; 1300 Coral Springs Drive. --Cheryl is know for her art quilts, pattern designing &has written a book called, "¡Quilt Fiesta!." --The lecture will be on "South of the Border". Cheryl's interest in Mexican folk art, where it began and how she transformed Mexican folk art tiles into quilt designs. --The Workshop is now open to non-Coral Springs Quilt guild members. The workshop will be on "Surprising Designs from Mexican Tiles". Cheryl will be using her book ¡Quilt Fiesta! as the base for this workshop. You will create your own block that will create a secondary design formed where the 4 block corners meet. No kit fee. Pattern include in workshop. --Recreation and Aquatic Center of New Port Richey on Van Buren St. between Massachusetts St. and Main Street. 4. Venice Area Quilters Guild: Quilting by the Gulf Show--March 8 and 9, 2014 (Saturday and Sunday). --Venice Community Center, 326 S. Nokomis Avenue, Venice, Florida. The winter is flying by! Here is a quick recap of our January meeting and some great photos. 1. Topic of the Month: Beth, one of our very talented members who is also a longarmer, taught us how to create a striped chevron quilt! The project was interesting to learn about, and the results are fabulous! 2. Round Robin Quilts: we have a lot of beautiful Round Robin quilts in progress! They will all be made into beautiful quilts for children in need. 3. Antique Block Challenge: Beth's amazing antique Pennsylvania Dutch friendship blocks were turned into a bunch of "modern" quilt blocks! They all came out very differently but looked great together! One of our lucky members won all of the blocks! 4. Riley Blake Challenge: our Riley Blake challenge is due in February, but some of our talented members got a head start on their projects. Here are the great results! 5. Show and Tell: check out the beautiful quilts that our members recently completed! Reminder: our next meeting is Saturday, February 15th, from 10am to 12pm at StitchCraft in Boca Raton! See you soon! Quilt Shows and Competitions - From the Mailbag! Here is some information we've recently received in our mailbag regarding upcoming quilt shows and competitions. Enjoy! 1. Florida Modern Quilt Retreat! --The Sarasota Modern Quilt Guild is organizing the first Florida Modern Quilt Retreat! --It will take place on May 15th to 18th, 2014, at the Kenilworth Lodge in Sebring, Florida. --The retreat lasts for three nights and includes optional workshops, breakfasts, some dinners, door prizes, etc. --The cost is $250 for double occupancy for $350 for single occupancy. --The Suncoast Quilt Expo will be held on Friday and Saturday, March 7th and 8th, 2014. It will be held at the Bradenton Area Convention Center (1 Haben Boulevard, Palmetto, Florida). --The Chase Family Gallery of The Mandell Jewish Community Center will present, "Connecting Threads Quilt Show - Quilting as part of Jewish Life,"a quilt show for its summer art exhibition. --It will be held from July 8th to August 31st, 2014 in West Hartford, CT.
--The exhibition will demonstrate how Jewish women with a simple piece of fabric and a length of thread has had the ability to connect Jewish traditions from one generation to another. Quilts that meet these criteria are welcome. --Quilt entries are open until April 4th. --For more information, please contact southfloridamod@gmail.com for the flyer. --The Belleview Busy Bee Quilters will host a quilt show on Friday and Saturday, February 14th and 15th, 2014. --The show will be held at Silver Springs Shores Presbyterian Church, 674 Silver Road, Ocala, Florida. For the Boca chapter, here is the upcoming information for the Blocks of the Month! FEBRUARY: Scrappy Trip Around the World block, 12.5 inches square. Please use as many colors and scraps as you like! MARCH: Glimma Crosses Block (make one or more), 7 inches square unfinished. Use any colors you like! Here are some fun photos from the Boca chapter's October meeting. Enjoy! East Pasco Quilters and Greater Dade City Chamber of Commerce January Quilt show in Dade City. The 2014 Kumquat Festival will be held January 25, 2014 in Dade City Florida, and includes the Kumquat Quilt Challenge. Participation is open to all, and there is no entry fee. The 2014 theme is "THE ORANGE DIMENSION ". Prominent and creative use of orange is required. There are six categories, including a Junior Quilter category for quilters age 17 and under. Adults have a choice of five categories, including Small Quilts, Large Quilts, Wearables, Miniature Quilts and Miscellaneous items. Entries should be submitted to the Greater Dade City Chamber of Commerce office between 8am and 5pm beginning January 13 and January 17, 2014. The Quilting Guild of The Villages will be holding our Second MarketPlace of quilt and sewing vendors this coming January. 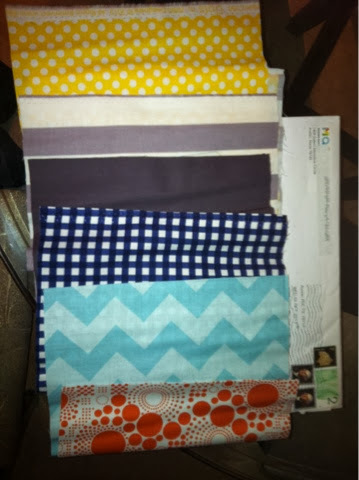 I just received 6 fat eighths of Riley Blake fabric in the mail. One of the benefits of joining the Modern Quilt Guild! Here is a brief recap and some fun photos from our July meeting! Enjoy! Wonky log cabin blocks and some "put a bird on it blocks" from the Virtual Bee. The Block Swap completed blocks! The Sunbonnet Sue challenge blocks. 11 vintage hand-sewn blocks were given to volunteers, who will "modernize" the blocks to "Save Sunbonnet Sue!" --We discussed delegating responsibilities in the guild, such as bringing snacks, updating the website, taking photos, etc. A few members have volunteered, and it will be fun to have everyone participate! --We discussed about how to focus the guild on more "modern" topics. Accordingly, each meeting for the next few months will focus on a specific modern quilting topic. The August meeting will focus on "what is modern fabric." --We mentioned the various challenges, contests, retreats and news in the quilt world. --We talked about each member creating a sewn/quilted nametag for the guild meetings each month. There are some beautiful examples of nametags on Pinterest and the internet for inspiration! We look forward to seeing everyone at our next meeting on Saturday, August 17th, from 10am to 12pm at StitchCraft in Boca Raton! Jupiter Chapter - July Meeting Recap! Joan opened the meeting to 20 attendees, several of whom were already sporting name badges (see photos). News in the Modern quilt world included the first sewdown in Philadelphia Sept 6-8, and the Portland Meetup August 15-18 hosted by 9 modern guilds. Marta also gave us an update on the blog world. She’ll do something more specific for our September meeting. Several members brought books and articles to share with the group. Patty R. provided our first member presentation. She spoke extensively about her experiences designing fabric, from preparing or selecting artwork, to translating these into images, to actually creating fabric, wallpaper, decals, even gift wrap. She uses Spoonflower.com for the creation part and also has a blog there where she can sell to the public. Her experiences generated tremendous excitement and dozens of questions. We continued our discussion of a “community” quilting activity. The Block Party group is limited to 12 members and is full. The Block Swap group still has room; anyone who didn’t attend the July meeting is welcome to bring the block as specified below. · Block Swap: Four members will do the block swap with the theme of “Shapes”. Each person will make two (2) 16 ½” blocks a month – one to keep and one for the “Raffle”. The “Raffle” block will be given each month to one of the Swap members at random until all of the members have received a “Raffle”. Guidelines for the blocks for August: Make (2) 16 ½” blocks, cream-colored background, Any “Bright” color(s) you like as secondary color. The “Shape” to incorporate is “Squares” – any number of squares you would like. · Block Party: Each month one member will specify a block(s) which she would like to receive from the other 11 members. Joan took the first month, asking for 2 – 16 ½ “ blocks. The first block must be an “X” with a red background and a cream letter. The second block must be an “O” with a cream background and a red letter. Letters can be any size, any design and any quilter’s cotton fabric. Most liked the idea of a local sewdown (the modern term for sew in) where members can get together and work on their individual sewing projects. Since more space might be needed to accommodate 20+ machines, etc. Joan will investigate possible use of the Jupiter Community Center. This also might be an opportunity to offer sewing guidance to members of the community expressing interest. · Meeting August 17th, 1:30 pm Quilter’s Choice in Jupiter. Remember to bring a door prize (a pattern or other sewing item – could be repurposed) and work on those name tags. · Nan to present Modern Applique in August and Marta to acquaint us with Pinterest in September.